U.S. Secretary of Education Betsy DeVos met with university leaders during her visit to FIU on April 6. 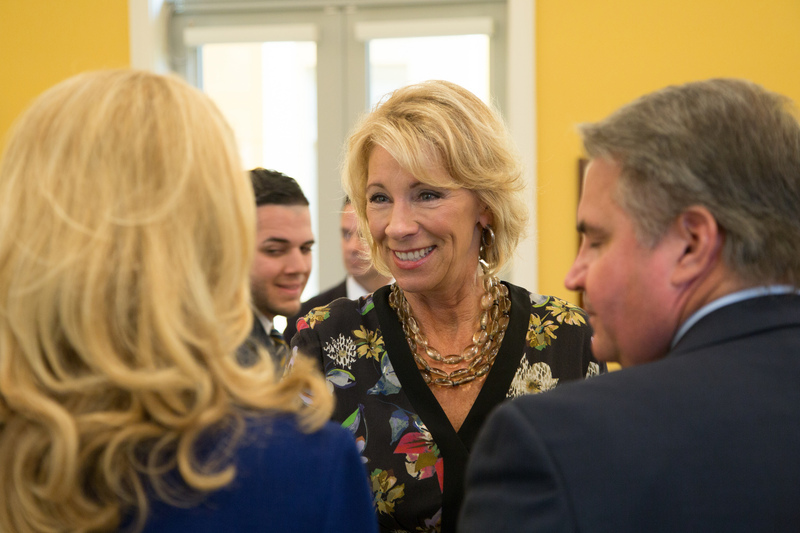 U.S. Secretary of Education Betsy DeVos visited FIU April 6 to meet with administrators, faculty and students and learn more about the university’s initiatives to help students succeed in the classroom. The trip included a meeting with President Mark B. Rosenberg, a tour of the Nicole Wertheim College of Nursing and Health Sciences’ Simulation Teaching and Research Center (STAR Center), and a roundtable discussion with faculty and students. It was DeVos’ first visit to a public university since becoming secretary of education in early February. 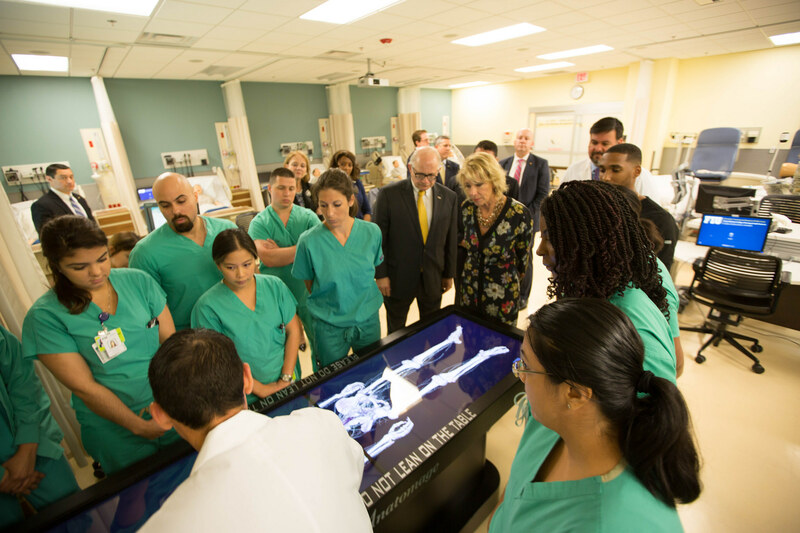 While on campus, DeVos got a first hand look at the innovative resources, technologies and teaching environments that exist in the STAR Center, which resembles a real hospital ward and allows students to learn under various real-life, real-time scenarios and settings. Following the tour of the facility, DeVos joined more than a dozen faculty and students for a roundtable discussion. Over the course of a half hour, DeVos listened to concerns and answered some questions revolving around higher education, including the cost of higher education, the future of the Deferred Action for Childhood Arrivals (DACA) policy and the Education Department’s main priorities. Students and faculty also shared their own experiences at the university and some of the programs and resources that have helped facilitate learning at FIU, namely the Learning Assistant Program. Founded by STEM Transformation Institute Director Laird Kramer in 2008, the LA program at FIU has become the largest such program in the country, featuring approximately 320 learning assistants that help increase the number of STEM graduates. Betsy DeVos tours the STAR Center with FIU President Mark B. Rosenberg. Laird went on to explain that the passing rate for college algebra, one of the courses that has been identified as a stumbling block for many students on the path to graduation, has improved its passage rate by roughly 40 percent in part because of the program. Senior Robert Wood, a learning assistant studying chemistry and psychology, shared the value of his experience an LA and as a student at FIU with the secretary. He hopes that DeVos can see the work that is happening at FIU and find ways to implement some of the ideas around the country.